Secret weapon of British blues-rock fires up and gets reasonably crazy – in style. 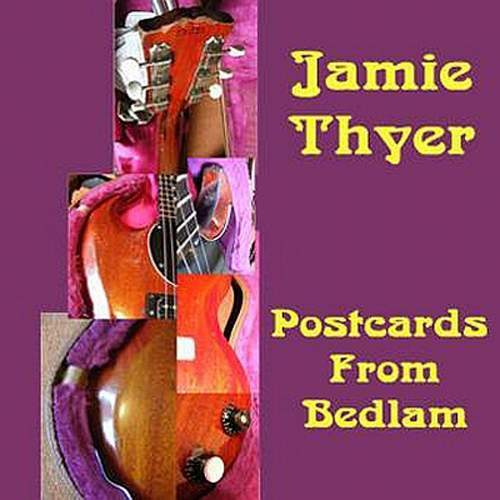 Had he started out in the ’60s, today Jamie Thyer’s name could’ve been mentioned in the same breath as the names of Peter Green and Robin Trower who this axeman shared a stage with in the last decades, yet the veteran remains on the dark side of fame which, quite possibly, stokes his energetic missives. It’s not that the artist goes unnoticed – MOTT THE HOOPLE’s Verden Allen scooped Thyer for his band – while it’s with Jamie’s own THE WORRIED MEN that he truly lets rip. And that’s exactly what the guitarist does here, on the collection of originals and covers, where “The Thrill Is Gone” has been sped up and funked up to replace the sadness of B.B. King’s staple with a genuine spirit of freedom, although not before this slightly menacing, if alluring, “cut loose” attitude thickens into a heavy riff on “My Way” – not the Sinatra ballad, of course, but a rocking groover with a filigree flurries of solos. So yes, the real thrill is there, even when Thyer is infusing THE KINKS’ “I’m Not Like Everybody Else” with a tragic swagger or bending the tune of THE STONES’ “Play With Fire” into an acoustically driven threat. Jam-like pieces like “We’re Coming Home” may lurch towards shredding, yet a fantastic sustained note in the handclaps-propelled “Further On Up The Road” redeems such a fretboard crime, as does the drama of “The Light That Faded” where cello and electronic buzz provide contrast to Jamie’s sharp axe and Carole Warren’s vocals. On strictly instrumental terms, ballad “Rova” builds its tension in the twain between acoustic strum and electric twang, up to an orchestral scale, while the hoodoo sway under “Witch Queen Of New Orleans” is undercut with a couple of Ritchie Blackmore quotes on coda, and “Wake Up, Rocket Dog!” turns the joke around by taking a melancholy turn.